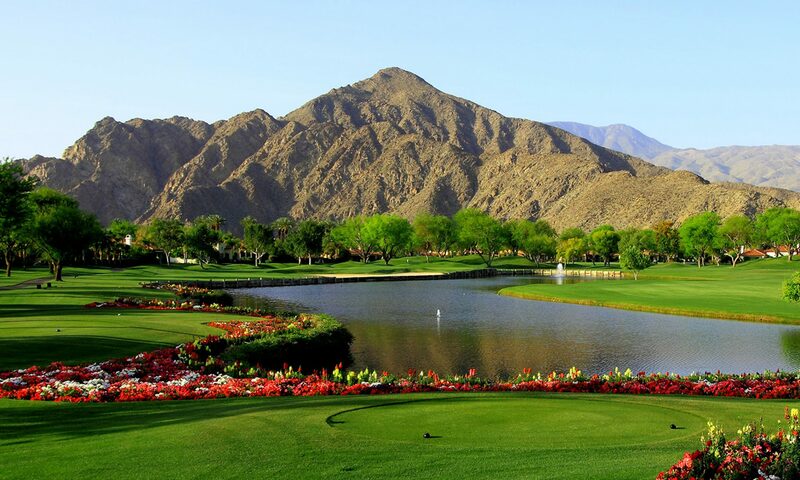 The Tradition Golf Club in La Quinta is a beautiful private equity Golf Club established in 1997 with the property’s origins dating back to 1902 as a ranch that hosted such names as Dwight D. Eisenhower. The location is special. Nestled at the foot of the Santa Rosa Mountain Range with breathtaking views from every direction. The community is made up of a select blend of custom homes including Spanish Revival, Early California, and Mediterranean architecture. In addition the beautiful Village area of semi custom homes situated on the bluff overlooking the golf course, offers views that take your breath away. The Prices of all these homes range from $1,495,000 to $7,000,000. The private golf course is an Arnold Palmer designed 18 hole championship course. Arnold Palmer himself owns a home at the Tradition and can often be found on the course, or enjoying a delicious meal prepared by The Tradition’s Chief. He has even been known to give pointers to members he sees while on the driving range. in addition the club offers a nine-hole par 3 course and a challenging practice facility including seven target greens. The equity membership opportunities are by invitation only and limited to 250 members. Whether it be the Junior, Social, or the Golf Membership that is desired, included are the exquisite dining facilities in the main dining room, use of the private Eisenhower Cottage, the Kennedy Suite and the famous Hacienda Del Gato dating back to 1920, and the fitness center. The Tradition Golf Club’s 5400 square foot Fitness Center offers advanced equipped facilities and world-class professionals. Included in the fitness center are private luxurious treatment rooms for restorative body therapies, Pilates reformers and a high-performance cardio and strength-training area. Fitness classes taught in the studio range from yoga to boot camps to Zumba. The Tradition also hosts special guest speakers with a wide variety of wellness topics. There are a variety of different member groups that meet to bike, paint, and trail hike. The Tradition members also have bridge groups, Canasta afternoons, knitting and stitching groups and book clubs as well as a“Yappy Hour” for our four-legged friends. Currently at The Tradition there are 21 homes for sale. In addition there are empty lots for sale ranging in price from $300,000 to $2,299,000. Most homes include pools and spas, and are on the golf course. The views from all these homes are spectacular. This is a special place in The Desert, and I would love to show it to you and tell you more about it. Just give me a call.